Success for me is not defined by worldly assets or accomplishments. Rather, it is by living a life that you can personally look back upon and feel like you lived up to your potential, maximizing the gifts you were given; can be an inspiration to your children, helping them dream big and also helping them avoid the mistakes you’ve encountered; is full of laughter, learning, and love. Cheesy alliteration for sure but true nevertheless. How would I define success? If this question is asking whether success is more defined by career or family, then, my emphatic answer would be: family. Career may enable your life and and even give it some purpose, but family IS life. 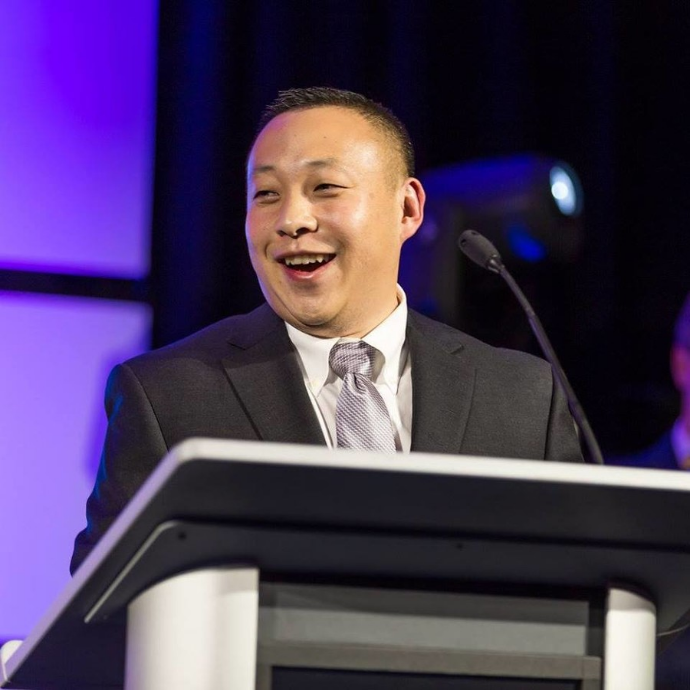 As a part of my series about “How extremely busy executives make time to be great parents” I had the pleasure to interview Chris Chuang. Chris is the co-founder and CEO of Republic Wireless, the company behind Relay — the smarter phone for kids. Chris is passionate about providing remarkably simple, affordable, and safe ways for families to stay in touch. As a husband and active father of four young children, this is a very personal mission for Chris. Chris has spent his entire 20+ year career in the technology sector, with the majority of his time focused on the communications markets. 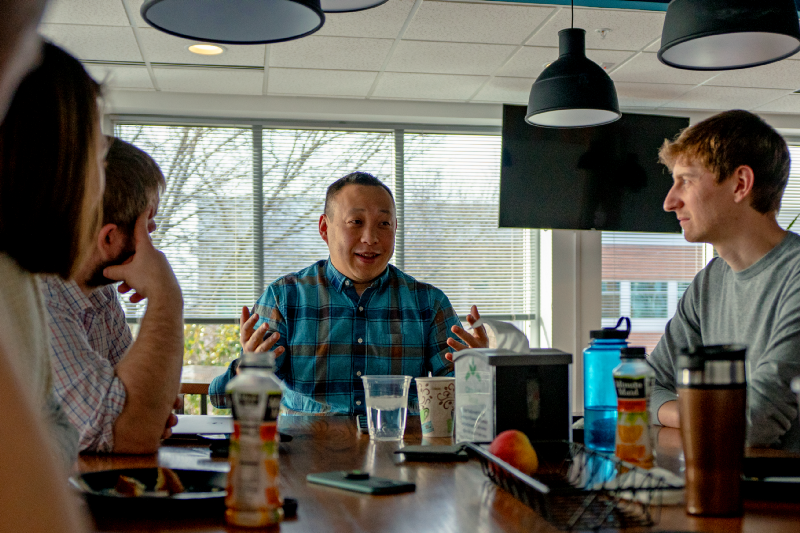 He has been recognized for his leadership as a Biz Journal “40 under 40” winner, North Carolina Tech Exec of the Year, and TechWire Top Startup Leader.Chris’ leadership abilities were honed by his experiences across a variety of companies and roles. 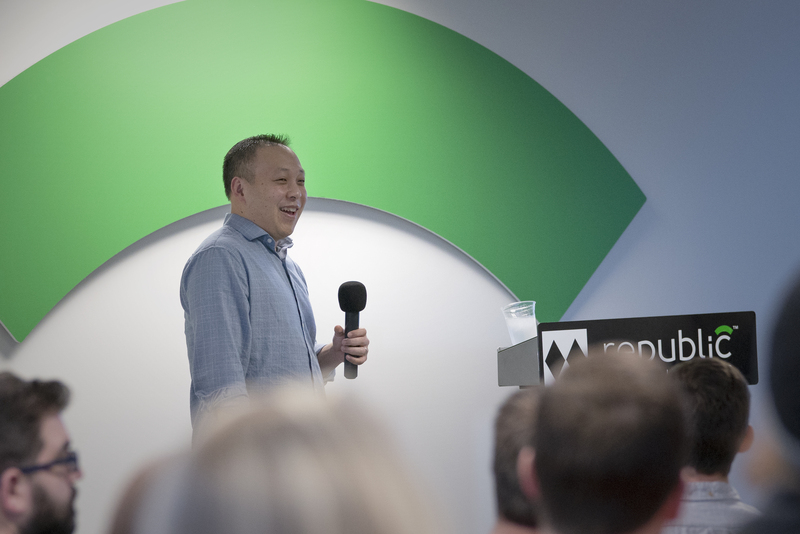 Before taking the helm at Republic Wireless, Chris served as COO of Bandwidth, helping grow the business from a small private company to a profitable public company with hundreds of millions in revenue and a billion-dollar market cap. Prior to Bandwidth, Chris was VP of Strategic Development at Motricity, where he led efforts to raise nearly $500M in financing and acquire three companies with that capital. Motricity later went public and reached a billion-dollar market cap. Earlier in his career, Chris worked as an investor at Technology Crossover Ventures, a multi-billion dollar VC fund, and as a consultant atMcKinsey & Company. Chris is a graduate of Stanford University. My younger brother and I grew up in Los Angeles and Orange County, California as the kids of immigrant parents who came to the U.S. from Taiwan to attend graduate school. My parents were highly devoted to our family, made extreme sacrifices as parents, and strongly emphasized the importance of succeeding in academics. Some might call them “Tiger parents.” While they didn’t often express their love verbally or with physical affection, they did so abundantly with their actions. For example, my father was my math tutor growing up, and he’d study the chapters ahead of where my class was so that he’d be prepared to help me when my homework caught up to that section. While academics were #1 in our household, the clear #2 was our shared love for the game of basketball. I played basketball starting in elementary, competed on travel teams, and ultimately played in high school. My parents drove me all over the state for tournaments and they even invested in private shooting, and agility lessons for me. Our family was always very goal driven, and after visiting the campus in 8th grade, one of our goals became for me to attend Stanford University. From then on, my father and I mapped out a course of steps and accomplishments we’d need to reach to have a chance at being accepted there. We literally began working on my application essays during my sophomore year in high school. Thankfully, our hard work paid off, and I was accepted into my/our dream school and attended Stanford. There are so many stories that have shaped my career, it’s hard to pick just one but, the two themes I can point to within the narrative of my career are: (1) doing the right thing for the company, whether or not it’s the best thing for your own interests, and (2) investing in relationships. Both of these themes were at the center of what led me to join Bandwidth in 2008, which is the company where I co-founded a business unit (Republic Wireless) for which I now serve as CEO. Before joining Bandwidth, I was running Strategy and Corp Dev for Motricity. I often joked that I “dealed my way out of a job”, as the last acquisition we made was of a company in Seattle, where we subsequently relocated the company. That deal was the wrong thing for my own family’s interests (we were happy living in North Carolina and didn’t want to move), but it was the right decision for the company. So, I put aside my family’s own interests, and just focused on achieving the mission for Motricity. Ultimately, this led to Motricity closing the deal and to me looking for a new job in North Carolina. This is when the second theme came into play: investing in relationships. Thanks to a relationship I had invested in during my time at Motricity, I was introduced to the co-founders of Bandwidth, David Morken and Henry Kaestner. They did not have a specific role they were hiring for at that time, but we really hit it off relationally, and so they took a chance on me and made me an offer to join the company. I had more lucrative offers from larger companies, but I chose to go where my heart was based on the strong burgeoning relationships with the Bandwidth founders. That decision turned out to be the best of my career, as the foundational relationships I had with David and Henry only grew stronger over the years, and along with it their willingness to trust me with responsibilities and opportunities beyond what my resume deserved. In turn, I so valued our relationships and the trust they bestowed upon me, that I did everything in my power not to let them or the company down. Fast forward ten years and the fruit of that relationship and trust is hundreds of millions of enterprise value creation for the company and my current role as CEO of Republic Wireless. In my current role as CEO, my day-to-day schedule is rarely ever the same. My time tends to go to whatever the most urgent and critical items the company is facing in that moment. That said, there are a few consistent personal priorities that frame each day for me. The first is dropping my kids off at school in the morning, a duty I happily share with my wife as we divide-and-conquer across our four kids. Unless I’m traveling, I try and hold this time sacred both out of respect for my partnership with my wife but also because it’s a special time to connect with my kids. The second consistent time of each day for me is lunch-time workouts. Part of our company culture is to encourage all employees to workout each day at lunch. We believe not only does this program support physical health, but it also helps folks be more energized, focused, and productive in the afternoons. It also helps them with family time as they no longer are forced to only work out in the mornings or evenings. I enthusiastically participate in this program by playing lunch basketball every day I’m not traveling. Lastly, I tend to consistently try to leave work in time to make it home to join my family for dinner and the kid’s bedtime routine. I usually will hop back online after putting my kids to bed to catch up on emails or do individual work, but I consider those dinner and bedtime hours (roughly 6:30–9 pm) as sacred family time that I will only sacrifice if absolutely necessary. I don’t have any research on this subject, but my experience and intuition is rooted in what I believe is a fundamental truth about how people develop: we develop based on the examples and models of people around us. Children will generally model the behaviors of and develop similar interests to their parents. If parents are not around much, they will be missing a key input for their development. That void may then be filled by other models that may not share the values you wish to grow within your children. Interestingly, this dynamic of following the examples and models your parents set for you also can continue to grow over time (even after you reach adulthood). For example, I used to think I would grow up to be very different than my parents. However, now as a parent myself, I find myself realizing they were right most of the time and I’m becoming more and more like them. Beyond the reasons articulated in the prior response above, another key reason why it’s important to make time to spend with your children is because it is an actionable way to show them your love and support. You can tell them “I love you” a million times (and you should) and then supporting those words with your most precious resource (your time) will cement that feeling for them deep in their hearts and minds. They may not always appreciate this investment of time in the moment, but as they reflect on their lives, few things will be more precious to them once they have that perspective. Coaching their basketball teams. I have always volunteered to coach my kid’s basketball teams, as I believe it offers a deeper context to connect with them on (i.e. — I can not only support them in their sports endeavors, I can be a more active teacher as well). They also recognize a deeper level of sacrifice and commitment to them through me taking on this more demanding role in their sports lives. Going on camping and road trips with each child (even apart from the rest of the family). As part of our local YMCA’s “Y-Guides” program, I take each of my children on camping trips where we are spending quality 1-on-1 time away from the rest of the family. This can sometimes include multi-hour road trips where we talk and really connect. Define and hold sacred certain parts of your day. For me, this is school drop off in the mornings, family dinner, and the kid’s bedtime. And, I will push back on every competing priority in my life as much as possible to hold these times sacred. While not everyone may share these principles with you, most people will appreciate your conviction and discipline on this topic and ultimately respect and support it. Work out during lunch (if your company will allow it). Physical health and exercise are important but they can often times end up competing for time with your children. Lunch is the perfect time to squeeze in a workout while not sacrificing family time. Deal with hard topics in the morning. When I receive a work email in the evening that I know will be mentally and/or emotionally draining. So despite being online, I will often punt it to the morning when my mental and emotional wells are refilled. I’ve learned that if I try and engage on those hard topics in the evenings, they will often strongly distract me from being present during my sacred time with the kids. Truly disconnect on vacations. Most people only have a few weeks per year for vacation with their children. During these times, try and draw firm boundaries with your co-workers and be as disconnected (from work) and present (with your kids) as possible. A good parent to me is not measured by any specific set of actions or results. Rather, a good parent is simply someone who is willing to put his or her own needs behind those of their children. This may sound like an obvious platitude, but it’s much harder to actually do than just say. My parents, for example, rarely expressed their love to us in words or hugs, but I believe they were great parents based on all the sacrifices they consistently made for us without complaint and, most of the time, without recognition from us until we were adults ourselves. As a parent, the times I feel like I’m doing my best job is when I see my kids experience a moment of joy that was from an experience I shared with them and not just from a new toy they got. When I know they invested in giving them something of worth that will last in their memories for a lifetime. Those are the #ParentWinning moments for me. Sharing stories from my own life with them where I was able to accomplish something beyond my own expectations and despite tough odds. These stories include how I got into Stanford University, how I was able to find success on the basketball court (despite being only 5’7” and not very athletically gifted), and how I’ve become a CEO. And, ultimately, I would not be able to inspire my kids with these stories if I didn’t find a way to spend quality time with them in the first place. Encouraging them to do something we use in our business — to establish BHAGs for their endeavors (i.e. — Big Hairy Audacious Goals). Only by reaching for the moon, do you ensure you land in the stars. c.) is full of laughter, learning, and love. Cheesy alliteration for sure but true nevertheless. If this question is asking whether success is more defined by career or family, then, my emphatic answer would be: family. Career may enable your life and and even give it some purpose, but family IS life. The book that most inspires me to be a better parent is the book I root my life in overall: The Bible. To explain this in full would be a long conversation by itself, but I will summarize it by saying I believe good parenting is ultimately rooted in unconditional love for your children exhibited through loving sacrifice for them. I try and remind myself of that my own selfish interests should not get in the way of being a better parent to my children. As a basketball guy, one of my favorite life quotes is from Coach John Wooden. He says: “Never mistake activity for achievement”. In today’s frenetic world, it’s easier than ever to get stuck in this pitfall. Speaking from experience, you could be “busy” for 20 hours a day but not necessarily spending your time in the most impactful way. I’ve continually used this key life lesson to prune away the activities in my life which consume my time, talents, and energies but aren’t necessarily advancing the goals I care most about. It is the times that I feel the busiest, that this quote is most critical to refocus on the things that matter to my family and my career the most. There are so many ways to answer this really big question, but instead of offering something that already is an important movement (like providing clean water to the billions of people who live without it), let me say this: What if we could start a pay-it-forward type movement centered around empathy? I have a deep-held belief that most conflicts, be it in the workplace or in the war zones of the world, find their roots in people lacking empathy for each other. What if every person in the world, when faced with their next moment of conflict, gave the “other person” or side the benefit of the doubt and tried to see things from their perspective (instead of their own). What if we all were slower to judgement, and quicker to grace? How much less strife would there be in the world? How much more world changing, problem-solving collaboration would we enjoy together? I’m not sure how to spark this movement, but I have conviction it would bring a huge amount of good to a massive number of people.